All prices INCLUDE SHIPPING. Check the manufacturer's warranty here. Why does Terri love it so much? Vitalizer Plus Technology creates a LIVING OXYGENATED WATER, which improves the functioning and homeostasis of the body. The Vortex spinning motion erases "homeopathic like" memories of organisms or contaminants that were previously filtered out of the water. You can make your own vitalized and oxygenated hexagonal structured water at home for MUCH LESS than designer bottled waters that have been sitting in plastic containers for an indefinite period of time. Why is Hexagonal Water so important? Hexagonal water moves more rapidly into your cells providing superior hydration, enhanced nutrient absorption, and more efficient detoxification. In the recently translated book, The Water Puzzle and the Hexagonal Key, Dr. Mu Shik Jhon explains that hexagonal water is the "functional" water unit within the body. According to his research, the hexagonal water structure surrounds healthy tissues, protects the DNA and supports a variety of metabolic functions. His research shows that both disease and aging are linked to a loss of hexagonal water in the body. Is there any research on Vitalized Water? Yes! A number of doctors and health professionals have conducted a variety of tests to verify the effectiveness of hexagonal water produced in the Vitalizer Plus™. Recent testing performed by Shelton Educational Services in Phoenix , AZ , showed that one glass of vitalized water improved Heart Rate Variability (HRV) scores by an average of 29.4% - in just 10 minutes. Similar testing showed that point scores using Meridian Stress Analysis ( MSA ) also improved significantly (24.7%), in the same 10-minute period of time. Other methods, including live blood analysis, body composition analysis, and Kirlian photography show marked improvement after drinking vitalized water. Where can I learn more about hexagonal water? There are two very good books that summarize the research on hexagonal water. The Water Puzzle and the Hexagonal Key, by world-renowned scientist, Dr. Mu Shik Jhon, outlines over 40 years of research on hexagonal water. Hexagonal Water – The Ultimate Solution is a shorter, more recent outline of the latest research validating hexagonal water. It includes a discussion of the role of hexagonal water as it relates to various health conditions in the human body. Both books can be purchased on this website. Does vitalized water have a shelf life? When kept at room temperature, out of direct sunlight, and away from strong electromagnetic fields, the water produced in the Vitalizer Plus™ will maintain a stable hexagonal structure for over 3 weeks. When refrigerated, the shelf life is much longer. Most people drink the amount they make every day. More InfoThe product is about the size of a blender. Spin the water for a standard of 9 minutes. If you spin the water for 18 or 27 minutes, and it will be more potent. One mineral cube (about a half-year supply with normal use) and a reference book are included when you buy the initial machine. The warranty is provided by the manufacturer and can be viewed at http://www.vortexwatertech.com. Future replacement cubes are available on our site. Shipping in the USA is free. If the product is being shipped to a California address, the price is slightly higher because we pay your sales tax. California residents, please order in the appropriate section. More InfoEmail us about International orders and available 220 volt versions. We will need your exact plug type. We will send you a quote by email including the shipping. You are responsible for customs fees. The product is about the size of a blender. Spin the water for a standard of 9 minutes. If you spin the water for 18 or 27 minutes, and it will be more potent. 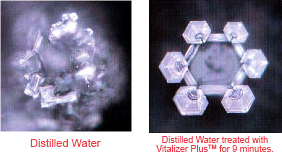 More InfoThe mineral cube is one of the secrets of Vitalizer Plus TM water system. The mineral cube in Vitalizer Plus TM reintroduces nature's nutrients (Calcium, Zinc, Magnesium, and Potassium to name a few) back into the water to help convert it to its characteristic hexagonal structure and increase alkalinity. The machine will flash "CC" for Change Cube, allowing you about 2 weeks time to order your replacements. The mineral basket is removed with a slight twist to the left to loosen. You can periodically remove the basket, before it needs changing, and clean if off with a paper towel. After replacing the mineral basket, simultaneously hold down both the "minutes" and the "start/stop" button for 3-4 seconds, with the power button on. This will clear the digital timer and you will notice that "CL" replaces the "CC" – ready for another 4000 minutes of operation. Spin the first pitcher of water for 9 minutes and then use to water plants. Drink the second pitcher after cube replacement. This order contains 1 cube, enough for about 1/2 year of normal use.